You are here: Home > 2015 > June > 23 > Escape! This June I crossed off a big bucket list item for me: finishing the Escape from Alcatraz Triathlon. It was a phenomenal race! I had so much fun out in California- perhaps someday I can jump in the bay again with my whole family around to cheer me on. Thank you to my family- especially my wife. You can’t complete a race like this without the support of your family and friends- through countless hours of training, agonizing over lotteries, travel planning, watching the kids, and everything else. While Katie kept the two youngest ones on the east coast my parents watched Noah while I was out on the course and cheered me on. Everyone’s support was immeasurably helpful. (The long & rambling part). I finished my first triathlon 13 years ago- the Wilmington YMCA triathlon. The Wilmington YMCA is a sprint distance tri, which typically means a 500 yard swim, 15 mile bike ride, and a 5k run. A unique aspect of the Wilmington YMCA is a longer 1500 meter swim in the Banks Channel at Wrightsville Beach, on the side of the island opposite the Atlantic Ocean. For me, this was a feature. Despite the fact that the swim leg is almost always the shortest leg of any triathlon, it does give some folks pause- typically the ones that don’t have any swim background. Fortunately that’s not me. Growing up I bounced around neighborhood swim teams- nothing too competitive, but I was no stranger to free style, back stroke, breast stroke, and.. well even some butterfly. It occurs to me that of my three brothers I probably swam the most- I guess that was just my thing. And my parent’s thing, since they were the ones that had to cart me around to all those Saturday morning swim meets scattered around North Carolina. So I grew up swimming. And I grew up riding around my neighborhood as well. When it came to swimming, I never had dreams of Olympic gold. But on the bike? It was easy to imagine winning a yellow jersey on arduous mountain stage every time I climbed a 40ft hill out of the saddle. Fast forward to college. After packing on the pounds over three years, I finally got back into shape my senior year. For me getting back into shape was a mixture of swimming, cycling, and the elliptical machine. Wilmington was just down the road- why not sign up? The race, my first triathlon, was a lot of fun. I wasn’t quite hooked, but I started paying attention to the wider world of triathlon, and my bucket list grew. An iron distance triathlon, sure. And the Escape from Alcatraz triathlon. Why the Escape? The Escape wasn’t just a triathlon in a magazine destination- it was the triathlon in a city I’ve grown to know and enjoy, if not love from afar over the past two decades. My first trip to San Francisco was in 1997, after graduating high school. In the intervening 18 years I have been back another six times. So clearly the west coast isn’t local to the Triangle, but I feel pretty comfortable in San Fran. The race course makes it that much more fitting. It’s not an all-day iron distance affair, but it’s not a 75 minute sprint either. For back of the packers lack me, Escape is a 3-4 hour affair that can bend your will but probably won’t break it. You know. 180-240 minutes of fun at 160 beats a minute. The swim: from just off the shore of Alcatraz to Marina Green, 1.5 miles in chilly San Francisco Bay- if you take the right line with the tide. All of the course material will tell you to “swim across the river.” Basically, the idea is that the outgoing tide will carry you west without much effort- but the trick is getting the most from the current without overshooting to the east, or, potentially worst, letting it carry you too far towards the bridge. Between the swim and the bike is a “refreshing” half mile run over to transition. On the bike, about 1200 feet of elevation gain over 18 miles. Flat from Marina Green past Crissy Field and a left turn before Fort Point to climb the first hill up into the Presidio and under the Golden Gate Bridge. Up and down a bit before the highest point of the ride, the Legion of Honor. 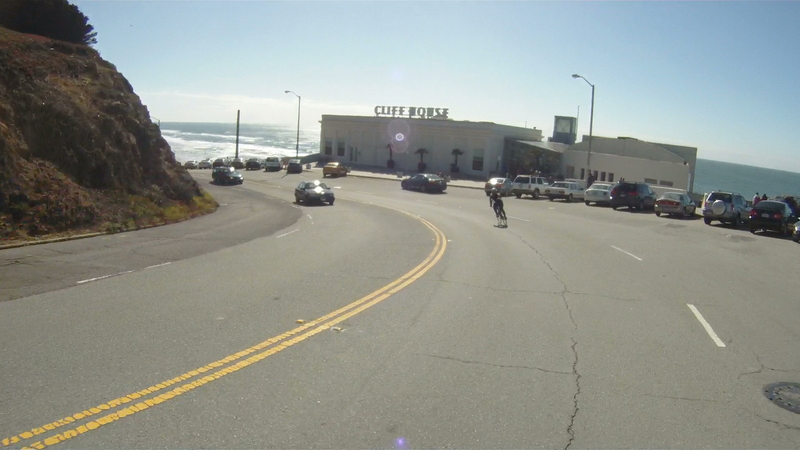 Downhill, past the Cliff House and Ocean Beach before a left turn into Golden Gate park, where the hills are more rolling before turning back to retrace the route back to Transition 2 at Marina Green. On foot, only eight miles. But those hills are just as fun in running shoes as they are in the saddle with clip-ons. Past Crissy Field again, up and under the Golden Gate Bridge, and all the way down to Baker Beach for about 2 miles on the sand. The infamous sand ladder to reach your last hill before the downhill, and the last 2 miles or so of flat running to the finish. This is what I call fun. At this point in my life perhaps one of the worst things about a race is the taper. Especially when I front load race week with sightseeing. I could say that my problem is that I’m not too interested in slowing down and resting more, but that excuse glosses over the fact that I haven’t followed a strict training regimen for any race since the B2B. A quick 5k across the bridge and back. We got to San Francisco four days before the race- for the main reason of catching a Giants game before they left town for a week. From Wednesday to race day on Sunday? Sightseeing! San Francisco is such a great tourist tan- there are so many different things to see, and practically all of them are easily accessible. I was able to keep my run streak going, and Noah even got excited about crossing the Golden Gate Bridge- it was his idea to run across the Bridge, and having done that he wanted to ride across it too. Taper? We were having too much fun. I got up sometime around 3:45. Simple morning routine- shower and an energy bar for breakfast. Normally it’d be yogurt, but the hotel didn’t have a fridge, and I didn’t plan very well for early morning calories. Worse, I forgot to take anything to snack on with me to transition, so that energy bar would be my only fuel until a gel after the swim. Eventually I got out of the hotel room and started the short bike trip from Lombard Street to Marina Green. Dawn was still two or more hours away, but the street lights were more than enough. Before I’d even gone a block a handful of other Escapees passed me on their way to T1. (Beyond the fact that they were cycling at 4 in the morning on fancy road bikes, the race numbers on their bikes made it certain). Of course there was a line just to get into T1. By the time I got into the transition area I couldn’t pass up the opportunity to wait in line again- to top off my tires with a community bike pump. Eventually I got my bike gear & run gear sorted- the two lines taking far more time than simply laying out my gear. I walked around a bit more to soak in the nervous energy and got over to the buses. There were a number of them ready to ferry athletes from Marina Green to the Hornblower at Pier 3, and that was the shortest wait of the weekend. On board I vaguely recall a conversation with a guy from Minnesota. Soon enough we arrived at Pier 3- probably around 5 or so. Time enough to hop in another line for the port o pots! Somehow the boat trip took an entire hour to simply go up the bay to Alcatraz. At the same time I didn’t really feel like time was dragging on that much at any point in the morning. The left side of the boat- at least downstairs on the first floor- had a large area cordoned off by the windows. I suspect this was to keep some of the weight of the participants on the middle and other side of the boat as the race got underway and everyone crammed the two exits. 3 minutes after the elites went for a dip, I queued up for my own dip in the bay and hopped off the northern exit of the boat closest to the island. In retrospect I wish I had chosen the other end of the boat- so that my line to the beach would have been better. During the first few minutes of the swim I felt surprisingly bouyant- I felt like I was floating on top of the water, with little need to actually put my head under water as part of the normal stroke cycle. Part, if not most of this feeling can just be chalked to diving into saltwater with a wetsuit- quite a bit different than doing laps at the YMCA in my jammers. After a few minutes I stopped to snap a few pictures. What can I say? Tokyo Chris just couldn’t resist. The waterproof pouch I sealed my iPhone in did its job, and I got a few pics of the Rock and the City from the course. Sadly there wasn’t much to see- all but the lowest portions of the city were socked in with fog- and forget about trying to see the Golden Gate Bridge. I think I could barely make out the Bay Bridge in one or two of the otherwise non-descript pictures. On the bright side the water was warm (enough) and calm (enough). An open water swim at Jordan Lake a few weeks before provided pretty good practice for the chop, and might have been a little worse (a Tropical Storm was passing through after all). A quick look at my GPS data might give the appearance of taking a relatively decent line to arrive at the beach. Honestly I look at it and think “when I do it next time I’ll swim toward the city more at the beginning and shave off two minutes or so.” (Shhhhhhh!) While in the water I tried to tell myself I was keeping a good number of people on both sides of my course, but I think I knew I was a bit far north. Ultimately my swim leg was my slowest comparative leg of the three. An odd feeling given my history. I imagine that the race itself attracts stronger swimmers than usual, I stopped twice to take pictures, and my line wasn’t perfect. And, well, I could always train more. I was a bit worried about getting too cold on the bike, so I put on a long sleeve tech shirt for the ride at T1. I probably didn’t need it, but I can’t say it hurt me all that much- I wasn’t exactly hanging off the lead when I reached the mount line. Overall the hills were about as challenging as I expected. What I didn’t expect were other riders lollygagging in the middle of the road after they passed someone- or just for no reason at all. There are only so many times you want to yell “on your left!” Ok I can’t say I was passing a tremendous amount of people with my bike conditioning, but still. Get over people! Its not that hard, and it’s just proper! I’m not sure what the actual drafting rules were on this course, but I settled in with five-ten familiar jerseys for much of the ride. It wasn’t a peloton by any stretch (or was there any coordination to speak of), but we all seemed to be making a similar effort. One of the best moments on the bike was briefly seeing the leaders fly by on Lincoln Blvd going the opposite way- which is to say they were probably about 14 miles and maybe 45-60 minutes in front of us at that point already. I felt pretty reasonable on the uphills, and I loved the downhills. How often do you get to bike through closed city streets? In San Francisco? Tucked in and flying on the downhills? Probably once in a lifetime. And I took it for all it was worth. I maxed out at 35 MPH; in my head I was going 50, perfectly aero. The reality is a bit more… mundane (and slow), but still. I had a blast. The hardest segment was a short stretch up Seal Rock Rd on the return leg, with an incline that reached over 16%. I’m not sure how many riders made it sitting on this stretch, but I was definitely out of the saddle harnessing all I could. But overall, the hills were manageable, especially considering my bike training was pretty poor. I pushed myself, but left enough in the tank for the run. My goal for the bike was under 75 minutes, and I hit the mark with a minute to spare. I was happy to see my parents on the ride in, and they were in about the same spot on the outgoing run. Additionally a handful of spectators gave my NC State gear a shoutout and I eagerly flashed the wolf symbol. Its always great to pass someone cheering just for you! I knew I wasn’t on Andy Potts heels as I left transition (he’d finished about 20 minutes ago! ), but compared to the runners in front of me I felt like I was moving at a good clip. The numbers seem to back it up- while I was (charitably) in the fat part of the bell curve for the swim & bike, my run split was practically in the top third. At this point in the trip I had already run across Crissy Field multiple times, as well as climbed the hill up to the Golden Gate Bridge and Lincoln Blvd. As you head up the first hill you are immediately hit with some relatively narrow stairs. I knew there was only so fast I could go with people in front of me and going down on their way back, so I mentally treated this as my break. By the time I reached Lincoln Blvd and the underpass below 101 (i.e. the Golden Gate Bridge) I could tell that the runners around me were gassed. As for me? The run was my reward, uphill, downhill, or flat. I was moving. Soon I was back downhill and on Baker Beach. Its pretty rad to hit the turnaround, look up and see the Golden Gate Bridge up ahead past the surf. That meant the infamous sand ladder was close at hand. Even though I didn’t push as hard as I could, I did better on the sandladder than the run overall (598/1811). Suffice to say it is a bit humbling to spend an hour passing a steady stream of athletes that are way out in front of you. For the most part I ignored the aid stations- at 60 degrees F and overcast I wasn’t too worried about fluid loss. I think the last aid station was around Fort Point, at the foot of the last hill. When I reached the bottom I let out a loud yell and tried to pick up the pace- I knew it was barely two miles before the finish. My dad had taken Noah out on the beach, and he said Noah had a great time playing in the sand and surf. I got to see them on my way in, and I think my mom was set up closer to the finish. Overall I was really happy with my run split- somewhere south of a nine minute mile average on the course- not too bad for the third leg of a triathlon that included a few narrow stair climbs. My last mile was a bit faster than an 8 minute mile, which is plenty fast for me on a distance run. I didn’t quite have the same finishing burst as this spring’s marathon, but I still had some spring in my step when I reached the finishing chute, and collected a few more kills on my way in. See all those people behind me? Kills. 3:15:58. The Day Is Mine!